This week will see me getting chapter one re-done, new poetry written, and work on getting yard sale items ready. I know it’s still too cold for actually having a yard sale but I want to get everything ready for spring. I love the Winter season (cold doesn’t bother me), but this year I find myself pining for Spring already. I’m dreaming of gardens and green leaves. lol. I did make a sojourn to Barnes and Noble yesterday. I intended to buy a cup of coffee and a magazine. Well, I did get coffee but I bought four magazines and had to drag myself away from the bargain book shelves other wise I may have spent gas (or food) money on books. The items I did buy have already inspired me go full throttle on my book to get it done, completely done. I also have made notes on a few new stories that are already simmering on my writing back burner. I never have a lack of ideas. I’m not complaining, merely observing. This year I really want to get things done. I’m all about the word done. I like it – done. Done. I hope the week is being good to you and you are finding inspiration to keep the energy moving in a good forward direction. p.s. Photos will soon appear here (tomorrow) from a brief park excursion the other morning. Three days into 2013 and I’ve been keeping to the poetry writing schedule thing I set up for myself. Which means that I’ve written three new poems. I took the time yesterday to sit down and write out my writing schedules for the next five months. I even logged those schedules into the calendar app on my phone so I get daily (or weekly) reminders of what I need to accomplish for that week (or month). I figured that it will help motivate me to stay on track. Enough of my rambling for the morning. I hope your day starts well and ends better. Remember: Don’t eat the yellow snow. Today I’d like to share some thoughts about a book I’m reading. It’s science with bits of poetry inside. Two great things together in the same place, sort of like Resse Cups. I started reading it this weekend while I was a at a friend’s house and I’m so, so , so glad that he lends out his books. I was hooked right from the start. The title drew me in and the first sentence captured me. I mean any book that starts off with comparisons to Star Trek will hook me, reel me in, and have my rapt attention. I admit – I love the show. But more to the point (that I think I was going to make) is that when a book (fiction or not) starts off with something I can relate to, then I’m usually in it for the ride to the end. The book talks about what is known about science today, in-particularly quantum physics, compared to what was known in the early 20th century and prior centuries. The amazing journey that early thinkers went on in order to learn is great. And the learning continues today. It’s written so that anyone can read it and understand it. You don’t have to have a degree in science, physics, or quantum physics in order to get it. I’m only on chapter two but I think I’m in love with this book. It’s one I’d like to own so I can reference back to it while I’m finishing my novel. 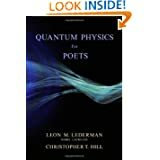 The writing in Quantum Physics For Poets really opened a floodgate of creativity in me. I wish this book was around when I was in school because I may have brought it in and waved it around in class while yelling, “See! This is what I’m talking about. This book has the answers I’m looking for!” But then that would’ve caused more trouble. But I digress…. If you like non-fiction, science, science fiction, and poetry then I highly recommend that you get this book. It makes you think. Have a great Monday and may you see something that lights a spark in you.